Welcome to Magazine Monday! 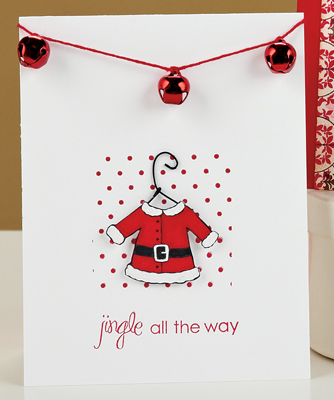 I don’t know about you, but here at Paper Crafts we’re in full Christmas countdown mode. Today we’re decorating our hot pink, lime green and ruby red tree for the Festival of the Trees, a fundraiser that benefits Primary Children’s Medical Center. Make sure you stop by the Paper Crafts Facebook fan page to see pictures of our tree in all its yuletide glory. If some of you are still needing a little push to get you in the holiday spirit, I thought I would bring in an expert on all things Christmas. She had so many gorgeous cards in Holidays Cards & More, Volume 4, I just knew she would be the perfect designer spotlight for this most festive time of year. 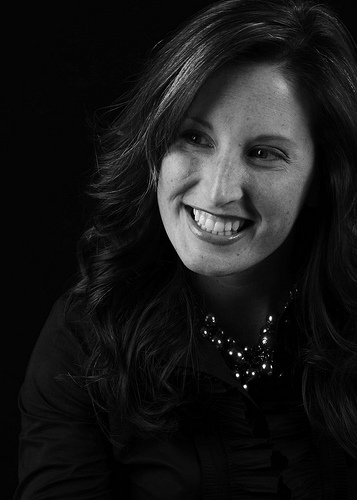 Grinches beware…let’s get to know the talented Becky Oehlers! I grew up in Bryn Athyn, PA , which is right outside of Philadelphia. 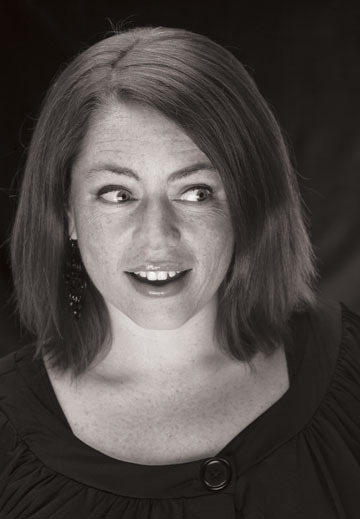 I am a professional opera singer and sing in many ensembles both in Philadelphia and New York City. 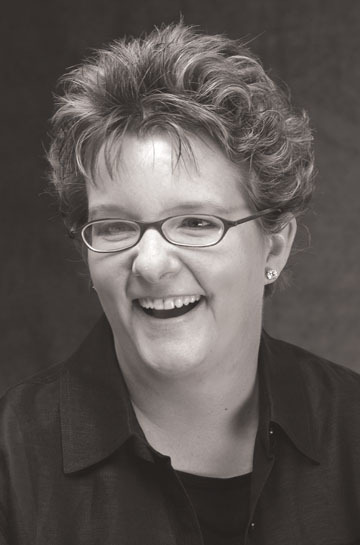 I am also on the voice faculty at Drexel University. Judy Garland, if she were still alive. This is a hard one for me…I love all types of music from Bach to Alison Krauss to newly composed music, but I would have to say that Beethoven’s 7th Symphony would be a pretty great theme song. That I was a double major in college for both voice and french horn performance. Nichole Heady. It was her blog that started it all. I think my challenge and my strength at the same time is trying to be innovative and really mold myself to the design of each stamp set that I work with. I try to let the style of the set dictate the art that comes from it. A well-designed stamp set and Copics. You are only as good as your tools. That’s easy! Christmas. Definitely. I love getting the house all cozy and dramatic, and I think that comes across in the work I create. I think I always do my best work around Christmastime. Very late at night. I have been guilty of staying up until 3 a.m. several times in my crafting life. None. It actually distracts me. My girls Emma (11) and Sophia (9) have often had card making sessions with me on the side. They have a little table in my studio. They even have their own small set of Copics! My husband is too busy collecting his own stamps. He is a philatelist. This is a weakness of mine. I am learning to print out all assignments and keep them in a book. I have gotten much better, but organization is a learned task for me. Yes! 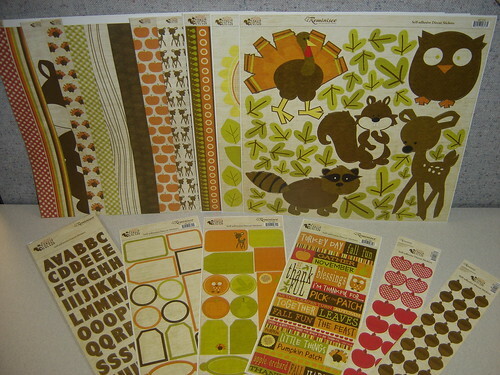 It was Paper Crafting with Kids, 2008. I have become more consistent in my style since then. 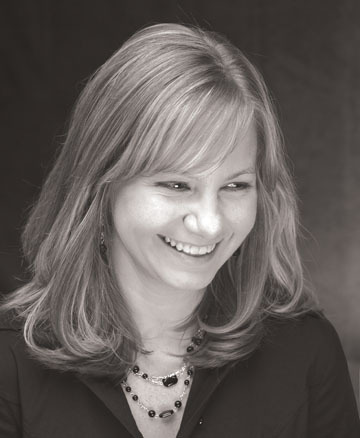 I am currently on the senior design team at Papertrey Ink. I have also worked for Kitchen Sink Stamps, Starving Artistamps and Inque Boutique. 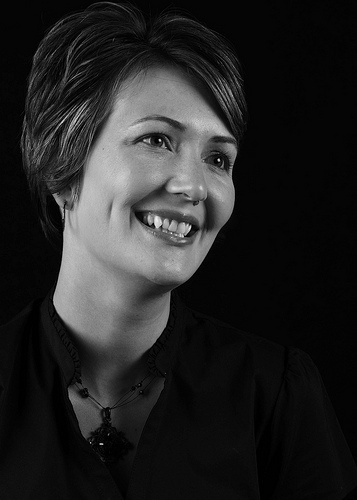 Debbie Olson – She is a true artist. My husband even says he wants to be like her when he grows up! 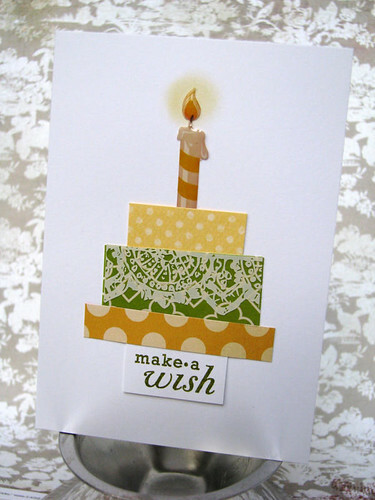 Julie Ebersole – I really like her simple and playful approach to card making. That really appeals to me. Jeffrey Rudell – He doesn’t stamp, doesn’t have a blog, but what this man can do with paper completely inspires me and blows my mind! Google him! I think in any situation like this fear is the only thing that will hold you back. Don’t be scared. Submit and submit. If you never try, you will never succeed. The worst thing that they could say is “no”. Oh, well! Try again! I do have a blog (www.hemidemisemiquaverdesignblog.com). Please hop on over! Thanks, Becky! I’m definitely in the Christmas spirit now! Leave a comment for Becky here and one lucky winner will take home all of Becky’s Holiday Cards and More cards (pictured above), plus two other surprise gems! All comments must be received by midnight (MDT) on Tuesday, Dec. 1. P.P.S. It’s time to announce the two winners from my Black Freebie Friday post! Congrats, winners! You’ve each won a copy of Holiday Cards and More, Volume 4 and Making Memories Flowers stamp set. I’ll be contacting you shortly to get your mailing addresses. Thanks to all who left comments! Welcome to Black Freebie Friday! I hope everyone had a fabulous feast yesterday and was able to find a few minutes to reflect and “give thanks”. While many of you will be dressing your Christmas tree today, I’m sure there’s just as many who will be starting their day a tad bit earlier than the rest of us. For those of you who are braving the crowds for all the Black Friday sales, I tip my hat to you. I am most definitely NOT a morning person. Unless you refer to “morning” as 12 a.m.! Since I know many of you get your creative mojo in wee hours of the night, I know how precious those few uninterrupted hours can be. And since we’re entering the busiest time of the year, we all need to make the most of our creative time. After all, Christmas is less than a month away! Which is why I love our Gift Trios feature in our November/December issue. 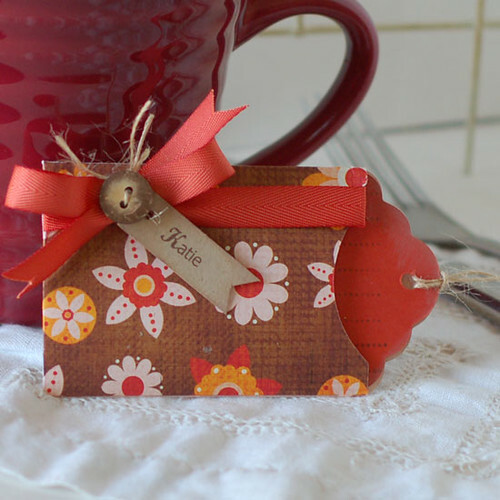 If you’re looking to save time and supplies, why not make a matching tag, bag and card? Incorporate the same product into three different projects and take the guesswork out of the equation. 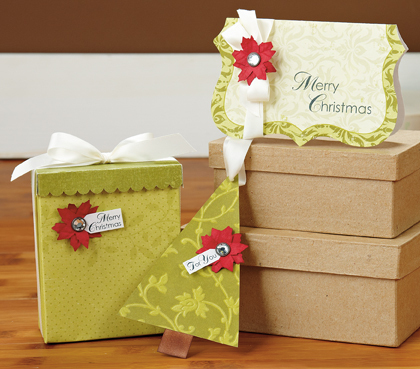 Paper Crafts Pro Wendy Johnson's Poinsettia Trio appeared in our November/December issue. I love how perfectly these projects coordinate with one another. Who wouldn’t love to receive these gems for the holidays? If you’d like to download the pattern for Wendy’s cute box, click HERE. In honor of Black Friday, I’ve got two prize packages that you don’t even have to leave the house to fight over! Leave a comment telling me if you plan on shopping ’til you drop today or taking it easy and enjoying the long weekend. I’ll pick two winners to receive a copy of Holidays Cards & More, Vol. 4 and Making Memories Flowers stamp set. 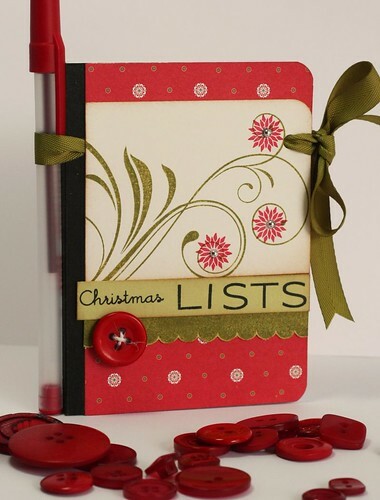 (I can totally see these stamps used as snowflakes, wreaths, poinsettia flowers, etc!) All comments must be received by midnight (MDT) on Sunday, Nov. 29. Two lucky winners will each take home these prize package! 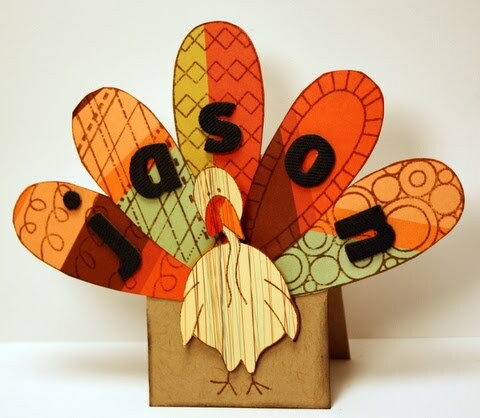 All of us at Paper Crafts hope you’re having a day full of great family, friends and food. And if you’re coming to us today from some place other than the U.S., we still hope you’re having a wonderful day and taking some time to count your blessings. 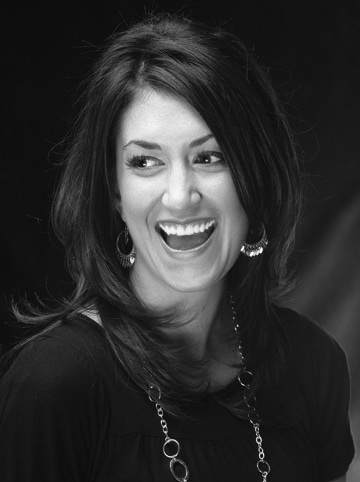 If you’d like a few trendy tips for showing your gratitude, swing on by the Moxie Fab World blog to read my post all about showing gratitude in unique ways. Previous odd jobs include balloon bouquet maker (fun! ), gourmet food basket designer (mmm…that was a good one) and roller-skating carhop (still bear the scars from that one). I am frugal. Not cheap, because cheap sounds yucky. Frugal sounds less yucky and more wise. When it comes to designing, I tend to think too much. This is both a blessing and a curse. Numbers 3 & 4 combined make for some pretty big disadvantages when it comes to designing. 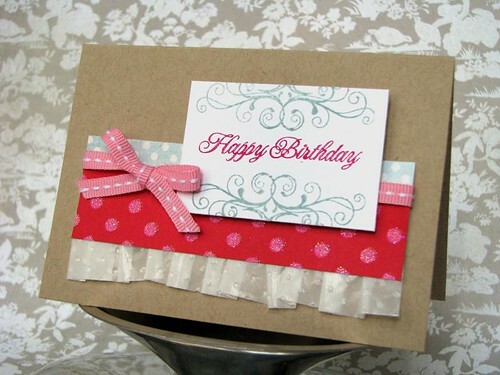 For instance, when I go to make a card with my favorite paper, I am most definitely going to plan, plan, plan that card out to a T before I make a single cut in that paper. And then when I finally do bite the bullet, I simply cannot part with the tiny sliver that is left over at the end of my projects. So, what’s a girl to do? Not a new concept, I know. However, it’s new to me, so follow me here. First, I scrounged up what I considered to be the perfect container. And what did I find? A pewter “Give us this day, our daily bread” plate. (Anyone else have one of those?) It’s possible that I picked this plate because I am lazy and the china cabinet is right next to my supply cabinet. Next, I set the said plate directly behind me on the aforementioned supply cabinet. I filled it up in approximately one week of card making. No joke. I just tossed in various patterned paper scraps, extra die-cuts, stamped images that I ended up changing out, etc. On to actually using the scraps. This is where little known fact #4 comes in. I decided to challenge myself to use the scraps to make complete cards in 10 minutes or less. Now, I *love* quick and easy cards. However, have you ever noticed that it sometimes takes quite a bit of effort to make something that’s quick, easy and cute? Yeah, me too. 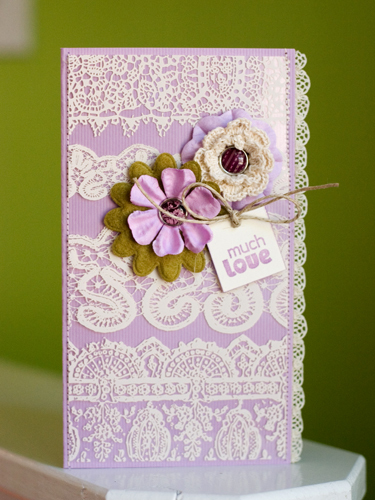 I wanted to use mostly scraps, along with simple cardstock bases, and to limit any extra supplies to sentiment stamps or items absolutely necessary to finish up each card. I wasn’t super legalistic with the rules…I just tried to be conscious of the fact that the goal was finishing, not thinking too much, and not taking up extra time on non-necessary items. Nothing fancy…just a little scrap paper cake. I absolutely could not part with the candle sticker that ended up getting cut from a project! I allowed myself to use some yellow chalk around the candle sticker because it was a super quick add-on. Then I added the scalloped Hambly overlay to the green layer because I thought it added to the impression of frosting. Love that. The stamped sentiment serves as the cake base. 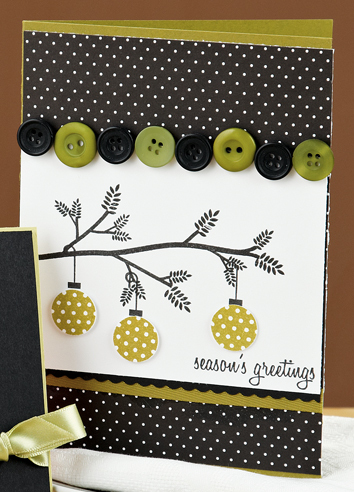 Next up is a birthday card with a dotted theme. I’ve been playing around with dry embossing on glassine bags and thought the extra strips might look cute as a ruffle. The embossed dots then led me to the glitter paper scrap and blue and white scrap, both of which happened to go well with the sentiment that made it to the scrap pile after a previous project ended up with a different flourish. All the colors matching was a happy accident. This one is probably my favorite of my marathon card-making session. I ended up punching the strip at the bottom and added glitter to it, so it *might* have put me just over 10 minutes. I love how the patterns and colors turned out…so soft and pretty. I’m super excited with how my scrap-pile-10-minute-challenge turned out! It totally made me realize how just going with the flow and not thinking so much all the time can be a good thing for me. It also made it much easier for me to feel okay about throwing the things out that I knew I likely wouldn’t use again because I was still throwing lots of loved little tidbits in the scrap pile. 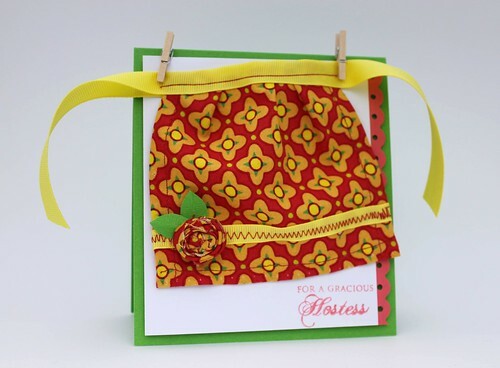 There was a bonus there in that I actually really looked forward to my scrap project all week because I was already anticipating getting to throw my favorites together in some new ways! I’d love to see any scrap-pile-10-minute-challenge cards that you come up with! Just link them in the comments below and I’ll visit your blog or gallery to check them out! 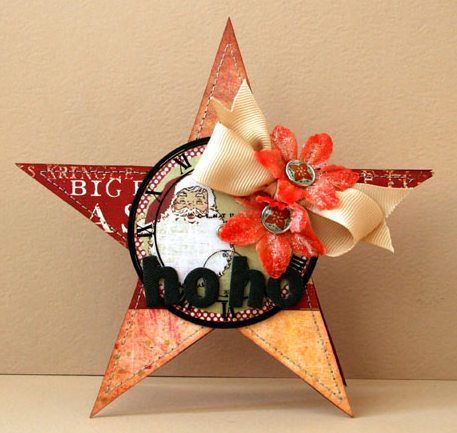 I’m considering turning this into a regular challenge on my blog, so visit me over there for more results from my scrap pile marathons! And…because it’s just so darned timely…yes, I’m frugal, so of course I will be out shopping on Black Friday! At 3AM. Wish me luck! And coffee. Lots and lots of coffee. Remember Grandma’s kitchen on Thanksgiving Day? She was the hostess with the mostest, and she had everything covered – even her best dress – with a frilly and functional apron. 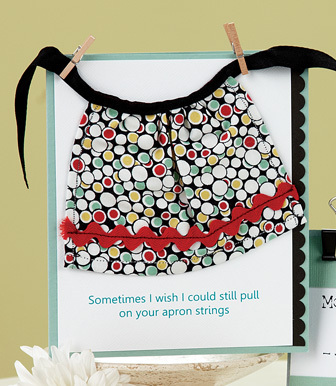 Aprons are pretty hip these days, appearing in stylish TV shows like Mad Men and all over Etsy and Anthropologie. I think that’s why this card from Paper Crafts Go-to Gal Kim Kesti that appeared on the cover of Card Creations, Volume 7 tugged at all of our hearts and made us ooh and ahh. Perhaps the trend of cute aprons coupled with Kim Kesti’s apron card inspired reader Winter Sims to create this utterly adorable card. And how appropriate! 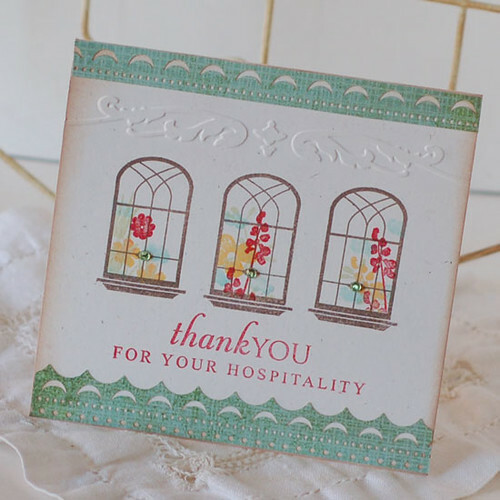 This card would be a perfect thank you for a gracious hostess on Thanksgiving Day, don’t you think? Have you ever browsed through a Paper Crafts magazine or special issue and created a card or project inspired by one of the designs you saw in the publication? We want to hear your story and see your creation! Maybe you took the design of a birthday card and made it into a Valentine, or maybe you switched up the colors to take a Mother’s Day card to a Father’s Day card. Submit an image of your Inspired By project, tell us where we can find the original in our magazine, and you just might have your card featured in the Paper Crafts Connection section of one of our issues! Now it’s your turn… Whip up a birthday or thank you card based on any card that you’ve seen in the pages of one of our many publications. Then, upload your card to your blog or in our Inspired By Flickr group. Be sure to tell us in what issue and on what page we can find the inspiration project. Next, use the Mr. Linky feature below to share your project with us and our readers! You’ll have until Monday, December 7th, at 9 am MST to add your Mr. Linky link. Three winners will be chosen and announced later that week. The three winning cards will appear on the blog, and each winner will receive a free subscription to Paper Crafts magazine or special issue of their choice! Make sure to take it one step further. Submit that card to us! Any time you create a project based on one you see in our magazine, submit it online here in the Inspired By section. 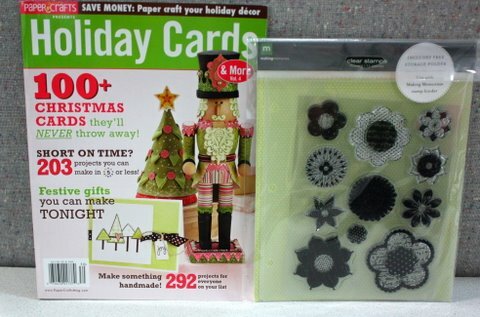 You just might have your card featured in the Paper Crafts Connection department in our magazine. P.S. Speaking of submitting, we have a very exciting submissions call for Card Creations 8. Get creating and submit your ultimate in wowie-wow, never before seen, most amazing cards EVER. Magazine Monday – Tag, You’re It! Welcome to Magazine Monday! It’s beginning to look a lot like Christmas! Even though we’re still a few days away from Thanksgiving, a massive snowstorm blew in this weekend reminding us that Santa Claus will be here very soon. Luckily, a few of us magazine editors are well-prepared because we just swapped Christmas tags at our monthly card group. Our little group (which just celebrated its one-year anniversary!) met at Jennifer’s house on Saturday. Since there’s always so much going on in December, we deliberately don’t meet this month – which means we swap Christmas tags in November. We each made 12 tags of the same design, swapped them with our fellow card group members and took home 12 different designs. I know I’m a little bit bias, but I think our tags are gorgeous! Here's all of our lovely Christmas tags...just waiting to be swapped! 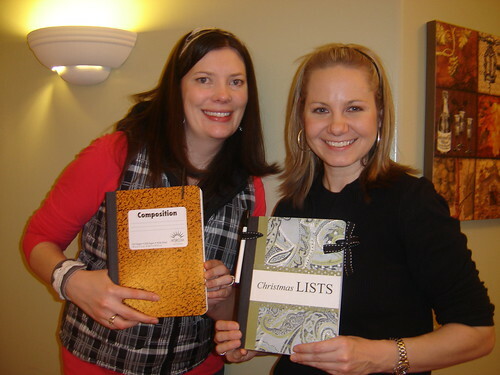 Lisa Johnson's holiday planner was all the inspiration I needed! The icing on the cake is I just happen to stock up on composition books during all the back-to-school sales. I found them for 53 cents a piece! What’s great about this project is you can adapt it for so many occasions. In addition to holiday planners, these make great journals (pregnancy/weight loss/travel), sketch books, appointment books, etc. 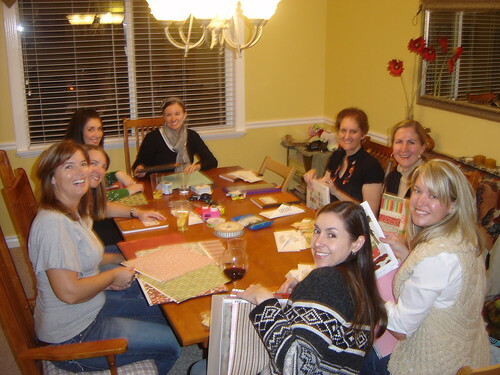 Once again we gathered in Jennifer's cozy dining room to unleash our creativity. I had everyone bring their favorite Christmas-themed paper and I provided the “Christmas Lists” title and the stamped envelopes that said “Coupons” and “Receipts”. (Just paste the envelopes in the front and back covers!) And it was so fun incorporating a pen into the design of the planner. Who doesn’t need a pen when they’re making their “naughty” and “nice” lists! 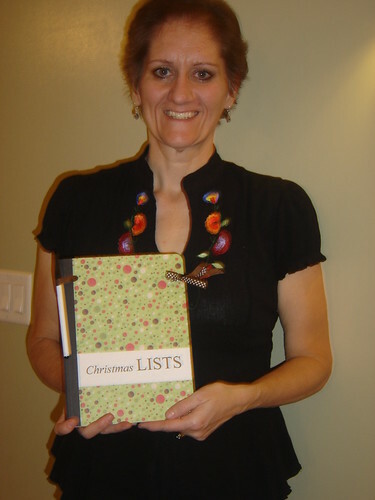 Here's Brenda and her festive holiday planner. Sarah and Brandy show off their cute planners and Brandy's baby bump! The Three Musketeers (Jennifer, Beth and Tracy) proudly display their planners. Megan arrived a little late to the party, so she missed our fun activity. She kindly agreed to stand up with me to show you the "before" and "after" look. 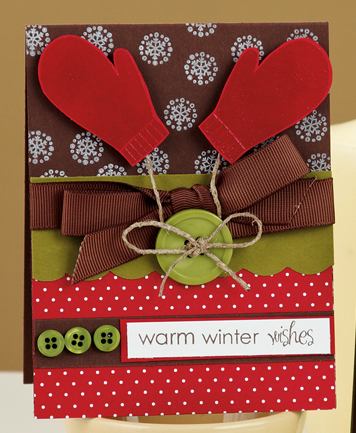 So there you have it…November’s card group is in the bag! 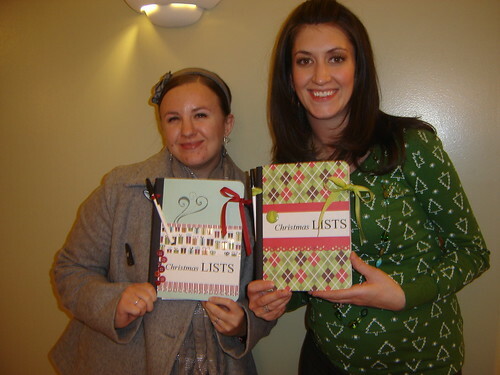 If you’re itching to do a fun project, I highly recommend these cute holiday planners. Why not make a whole bunch and give them away? Tis the season, after all! P. S. It’s time to announce the two winners from my Freebie Friday – I’m Thankful For… post! Congrats, winners! You each won Reminisce’s Autumn Forest collection! I’ll be contacting you shortly to get your mailing addresses. Thanks to all who left comments! P.P.S. There’s still time to upload your holiday treat containers to our November Gallery Challenge! Three winners will receive a 1-year subscription to Paper Crafts (or a special issue of their choice) and be featured on this blog on Monday, Dec. 7. You better act fast…this challenge ends at midnight (MDT) tonight. Click here for the details! Like the blog title suggests, I look forward to Thanksgiving because it allows me to reflect on all my many blessings. If you’re ever having a bad day, I really encourage you to sit down and make a list of everything you DO have. And try to include all the little things, because it’s the little things that make a rich, full life. I guarantee your glass will start to look half-full again. 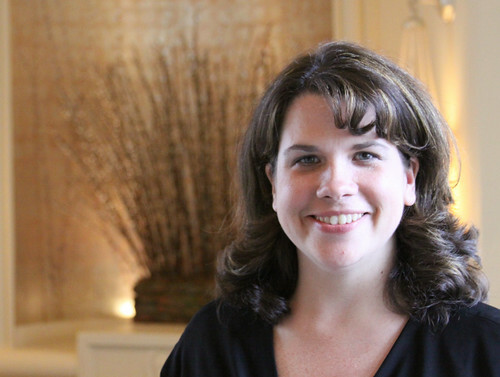 Miss Kim Kesti, one of our talented Paper Crafts Go-to Gals, recently hosted a five-part blog series where she encouraged her readers to post five things they’re grateful for. I loved reading all the comments and seeing pictures of the things that fill her with gratitude. I think my favorite was seeing her adorable toddler Eloise playing peek-a-boo. It’s doesn’t get much sweeter than that! Click here to see all her cute posts! As a mother of eight, family is obviously important to Kim. She made this gorgeous table decoration for our “Get Inspired” column in our November/December issue. If you’re looking for that one piece to set your Thanksgiving table a part, this one does the trick. It would also make a beautiful decor piece for your fireplace mantle or bookshelves, and the best part…you could display it year-round! Looking for that perfect centerpiece? Why not make Kim Kesti's Family Table Decor? Since we’re talking gratitude today, I just happen to have two sets of Reminisce’s Autumn Forest collection. This collection screams fall/Thanksgiving/gratitude. Talk about cute turkeys, squirrels, deer and owls! There’s also some nice solid prints, so if you wanted to recreate Kim’s project above, this would be a great collection to use. Wanna try your luck at winning this fabulous prize package? Leave a comment telling me something your thankful for right this very minute. All comments must be received by midnight (MDT) on Sunday, Nov. 22. Two lucky winners will be thankful for this prize package! I’m thankful for all of you! P.S. Like Cath mentioned yesterday, there’s still time to upload your holiday treat containers to our November Gallery Challenge! Three winners will receive a 1-year subscription to Paper Crafts (or a special issue of their choice) and be featured on this blog on Monday, Dec. 7. You better act fast…this challenge ends at midnight (MDT) on Monday, Nov. 23. Click here for the details! In the November/December issue of Paper Crafts magazine, we’ve assailed you with inspiring projects you can create for the holidays. 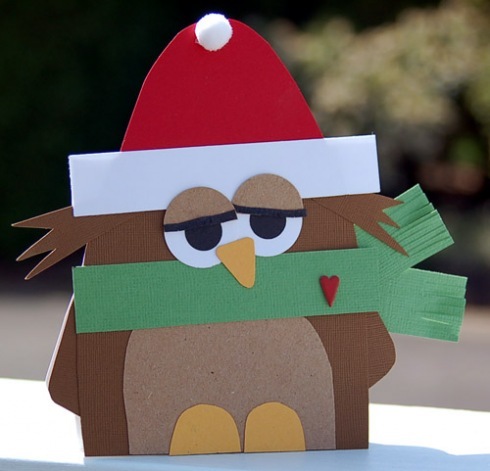 There’s an entire section devoted exclusively to holiday cards, a feature that shows projects with cute little Christmas critters on them and two features devoted to the gifting aspect of the holiday season. 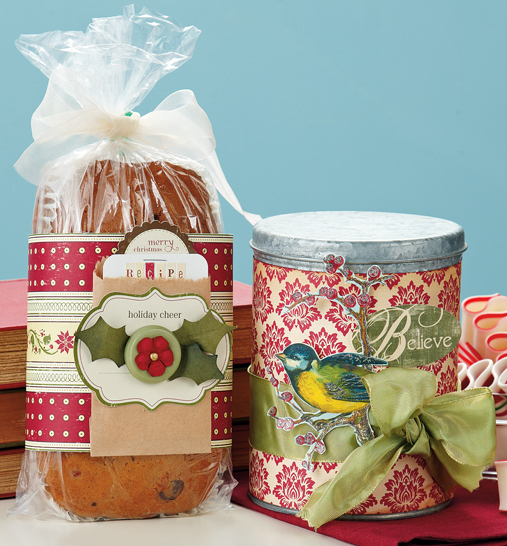 While the Gift Trios feature shows you great gift-wrapping inspiration in which the same product was used for a gift container, a tag, and a card; another feature, The Heart of Christmas, shows you fun and unique ways to wrap up the tasty goodies we like to share with friends, family and neighbors during this bake-fest of a season. Fresh from my oven to the pages of my favorite magazine. Known as the “bringer of pies” in my circles, I just happened to be baking a birthday pie for my oldest daughter the weekend before the opener needed to be shot…way back in July. So naturally I volunteered to make another “while I was at it” pie. 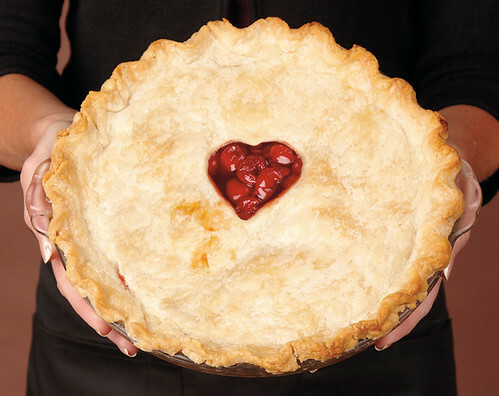 I was asked to cut a heart out of the center of the pie so the meaning of the title could be visually communicated, and while it was super easy to cut the heart out of the center of the crust, placing the heart in the smack-dab middle of the pie turned out to be much more challenging than I knew! Let’s just say that I’m very grateful for the powers of Photoshop, because as far as you know, *wink*, I placed that puppy dead-center, right? Speaking of challenges, I’m not sure if you’re aware, but our November Gallery Challenge is “centered on” festive treat containers. Inspired by fantastic designs such as these from the feature, we’re hosting a super fun challenge that offers you an opportunity to show off your own festive ways of dressing up food gifts of all types and varieties! 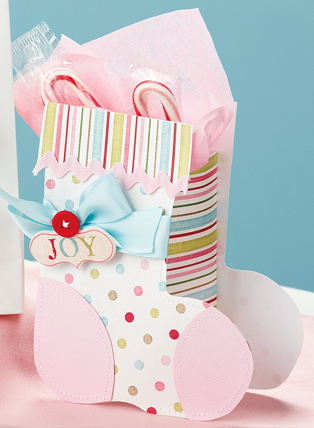 I love the sweet paper crafted stocking Paper Crafts Pro Wendy Johnson has used for this treat container! 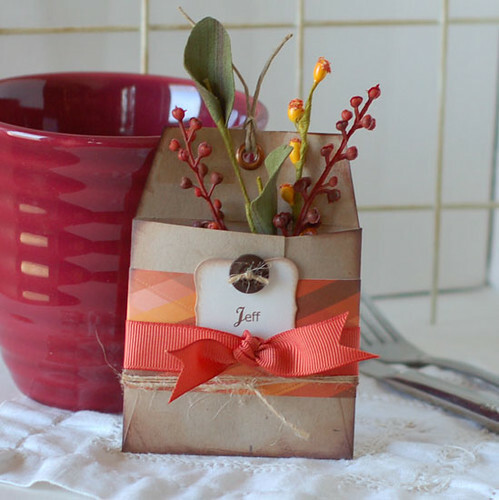 It doesn’t matter what your baking, there’s a way to paper craft the container! Here Paper Crafts Pro Susan Neal has fashioned a bread wrap and you could put just about anything in this beautiful container by Sherry Wright! You have until Monday at midnight (MDT) to upload your creations, and you’ll not only receive a prize and be featured on this blog if you win, but you’ll also be able to scratch those homemade treat containers off your to-do list before Thanksgiving even thinks about putting itself on the table! Click HERE for all the details you’ll need to get your craft on! P.S. We just sent out our Call for Submissions for Card Creations, Volume 8! Interested in submitting to our most popular special issue? Click HERE for all the details! I can’t believe Thanksgiving is a week away. I’ve been given my food assignment: mashed potatoes. Thank goodness! I’m pretty sure I’ll never have to bring made-from-scratch stuffing again after last year’s fiasco. The words “wallpaper” and “paste” come to mind. So, mashed potatoes it is! I can handle that. So what’s your Thanksgiving like? Do you have an elegant sit-down dinner? Or are you more laid back? We get together with the entire crew on my dad’s side, since there are too many of us for a formal meal around a table. 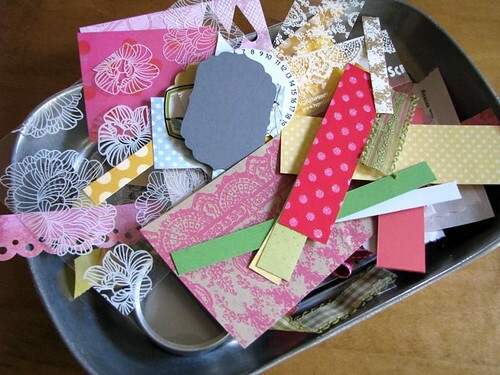 We do buffet style, so there is really no need for formal table decorations, place cards and the like, but this paper crafting girl can dream, right? In case you’re the type that goes all out with your table décor (and if you are, I’m jealous! 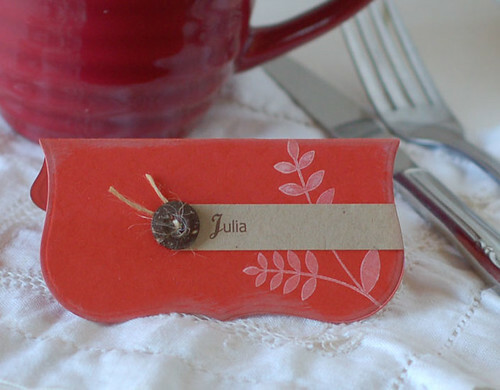 ), I’ve got a few place card ideas for you today. When doing this sort of thing, I always reach for products and tools that allow me to easily make multiples. Stamps and die cuts are the first things that pop into my mind, so here we go…four different place card ideas, each one easily reproducible. I’m here to make your life easy. This first card uses the largest die from the Labels 1 Nestabilities set. 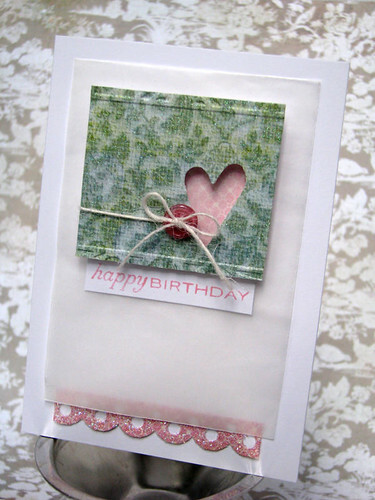 Just score and fold it in half, add a little stamping and you’re set! You can add the names by stamping them with alphabet stamps or print them using your computer like I did…super fast and easy! Next up is a little pocket card. I used the Tags, Bags, Boxes and More Cricut cartridge to cut these. 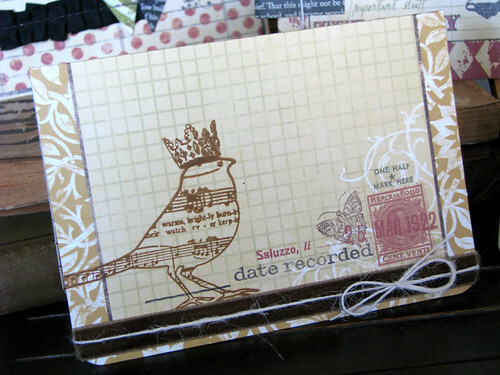 The tag pulls out and is stamped with some journaling lines. I thought it would be fun to have a space for each guest to write something they are thankful for. 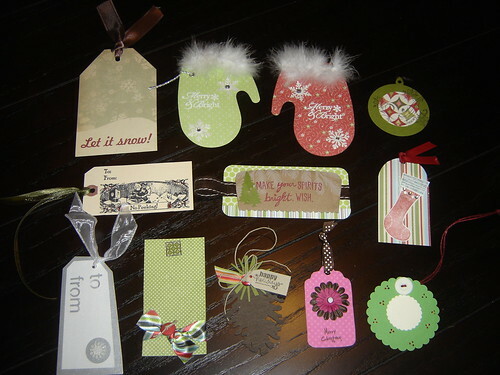 The tags could then be hung on a little tree or kept for next year, or even used on a scrapbook page. Next is a pocket made from a mini envelope. You can easily tuck a few berry sprigs (real or artificial) into the pocket for a simple, but elegant place card. And lastly, this one was made with the little pilgrim’s table in mind. 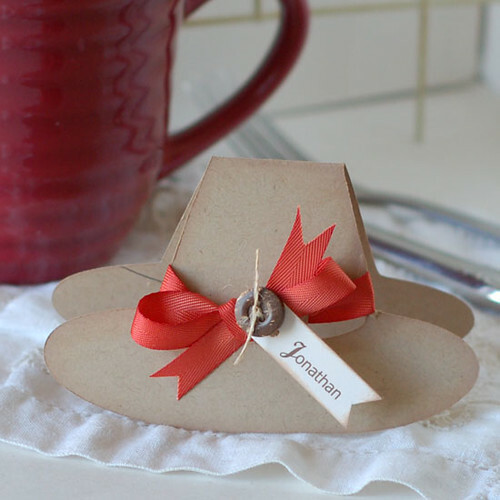 I know my little turkeys would get a kick out of having their very own pilgrim hat place card. This was cut using my Cricut and the A Child’s Year cartridge. Well, here’s hoping you get your table all “set” for the upcoming holiday! I’d love to hear your ideas for holiday table décor! And if you’re looking for even more place card ideas, check out the Photo Finish column in the Nov/Dec issue of Paper Crafts, where five Go-to Gals show you a different way to personalized place cards by adding photos. So fun…your guests will love it! P.S. It’s time to announce the winner of Melinda’s Happy Button Day post! Congrats, Rhonda! You’ve won an assortment of buttons from American Crafts! Kelly will be contacting you shortly to get your mailing address. Thanks to all who left comments! Although I’ve poked fun at the blending of seasons that starts sometime in September and ends December 25, especially since I live life in “magazine time” nowadays, there’s something about the spirit of Christmas that warms me to my toes and makes my Elf DNA kick in waaaaaay too early. My long-suffering husband (the original Grinch) wants to box me up with my Christmas decorations when I start humming carols in August. I just can’t help it! I start thinking about Christmas when we’re about halfway there — in late June. But based on your response to our lunchtime conversation last week, it sounds like Brandy and I are in the definite minority when it comes to getting a jump start on the holidays. Y’all have a hard-and-fast rule about the integrity of Thanksgiving celebrations and don’t ever toss the turkey and gratitude in a Cuisinart with the Christmas trees and carols. In spite of the commercial fuel that gets my holiday engine revving, I really love this blended and extended season for the focus on gratitude and giving — large or small, short or tall, it’s all about appreciating what we have and then sharing the love wherever we can for as long as we can. So for you, the members of the Paper Crafts family for whom we are so very grateful, I bring you Melinda’s hard work and gift to you. Just for you! A new banner for Paper Crafts Connection! And this will be the gift that just keeps on giving…since some of you may know that our Lone Design Man Matt likes to help Cath mess around with the banners over at Moxie Fab World, you can keep an eye out for the same attention to design detail here as we continue to make personal connections through the art of paper crafting. Maybe we’ll change the wallpaper. Or the mug. Or the look of her outfit. Stay tuned! Whether your gratitude is the centerpiece of a table laden with turkey and stuffing or a holiday that’s all about giving and sharing, I’m right there with you in spirit.